The dream of owning a classic, antique or vintage motorcycle is now a reality with Timeless Motor Company’s Vintage Motorcycle Collection. If you are a classic motorcycle enthusiast with a passion for rare antique bikes, a Timeless Motorcycle is the perfect way to fulfill your dream of owning a vintage bike without having the vintage collector’s wallet. The origin of these incredible reproductions started in El Paso, Texas in 2007. Owner Mike Hanlon, a master mold maker, machinist, and all-around motorcycle enthusiast, became fascinated with the unbelievable quality and tolerances of the castings that were taken for granted as standard practice a hundred years ago. Mike turned this fascination into quite possibly the most authentic vintage motorcycles ever reproduced. Timeless Motor Company’s motorcycles signify authenticity from the many brass polished accents, nickel plating, white button tread tires, thick leather belt drive and numerous cast metal components. Now located in Georgetown, Texas, Timeless Motor Company’s collectible masterpieces are available to the public in an affordable price range and can be purchased as a kit or fully assembled. Choose from the glory of the past Board Track model, the original Classic Street version, The Timeless Dream, 1911 Flying Merkel V-twin or 1911 V-twin. 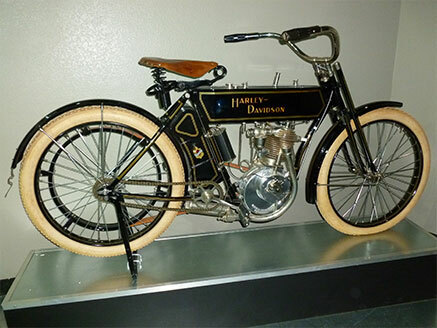 Timeless Motorcycles are produced to a 1910 era technology. Timeless Motorcycles are sold as collectors’ items only and are not to be used on streets or highways. Timeless Motorcycles are not represented as any other brand. Name badging and paint details are the responsibility of the purchaser.